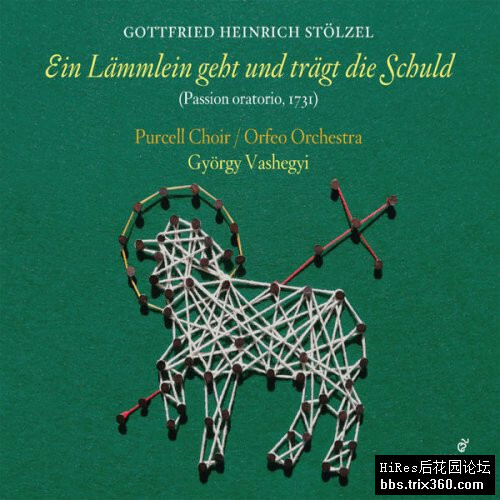 After their recent releases of Conti’s Missa Sancti Pauli and Rameau’s Les Indes galantes, conductor György Vashegyi and his Orfeo Orchestra and Purcell Choir present a world premiere recording of a passion by a today virtually unknown composer, Gottfried Heinrich Stölzel. The name of Stölzel does not ring a bell even with the keenest lovers of Baroque music, even though he was a significant figure in the musical life of Germany in the first half of the 18th century; he was held in highest respect even by Johann Sebastian Bach himself, just to name the greatest authority of all, as documents of the time show. The work recorded here is a so-called “passion oratorio”, a musical form widely used in the German-speaking world in the 18th century built upon a series of lyrical contemplations resting on the story of Christ’s passion. The libretto for Ein Lämmlein geht und trägt die Schuld was written by Stölzel hiself, and features a succession of recitatives, arias and chorales sung by the “Evangelist”, the “Faithful Souls” and the “Christian Church”. The work, premiered in Gotha 1720 and recorded here in the 1731 version, had such a great impact that it got performed in other German cities, including Leipzig on Good Friday of 1734 (where the church community did not relive Christ’s passion through Bach’s music but through Stölzel’s oratorio). 02. Ein Lämmlein geht und trägt die Schuld, Pt. 1: No. 2, Wohin ist doch mein Freund gegangen?